the use of crop protection materials in our food production is a source of ongoing debate – and much of it gives little credence to solid, scientific evidence. Earlier this summer, a US activist group released its yearly list of fruits and vegetables – the so-called “Dirty Dozen List” – they say consumers should avoid eating because they contain the highest levels of pesticide residues. The list, which included consumer favourites like peaches, strawberries, blueberries, apples and cherries, garnered widespread media coverage and spokespeople promoting it counselled consumers that the only safe alternative was to buy organic. Their underlying message was that fruits and vegetables produced by conventional methods, which include the use of crop protection, are not safe — an emotional message that ignores the regulatory foundation of solid scientific testing our food safety system is based on. A U.S. expert panel of toxicologists, risk assessors and nutritionists subsequently conducted an independent review of the above-mentioned list and concluded that, yes, residue levels were found on those fruits and vegetables. But those residue levels were below the accepted, legal minimums set by government. The expert panel further went on to state unequivocally that the list is misleading to consumers, that it hinders public health because it discourages the consumption of fresh fruits and vegetables and that there is no scientific evidence that the pesticide levels actually found on produce pose any risk. Based upon these findings, they stated, there is no reason why a consumer should use this list to guide their purchasing decisions for fruits and vegetables. They also concluded that there’s little evidence to suggest that there’s a significant difference in the nutritional quality of organic foods over those grown using conventional methods, a message which has been echoed by many other studies and reports recently. The independent report was commissioned by the Alliance for Food and Farming, a US non-profit organization similar to AGCare or the Ontario Farm Animal Council here in Canada – made up of farmers and farm groups with a mission to provide a voice for farmers to communicate their commitment to food safety and care for the land. The fact that residue levels are being found on produce at all is due in large part to technological advancements and the ability to detect ever-smaller product traces – and not because the levels are unacceptably high. Twenty years ago, water and food were tested for trace residues of contaminants in measures of parts per million. Today, testing equipment has become so sophisticated that levels are being measuring in parts per billion and even parts per trillion. This accuracy virtually ensures that traces of residue will be found, but these results can easily be misinterpreted by those seeking to further an anti-crop protection agenda. 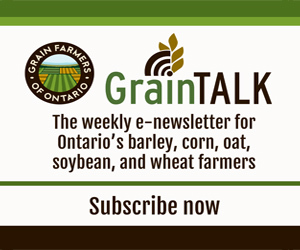 In Canada, the crop protection debate is also ongoing and farmers are paying attention. Unlike fruit and vegetable growers, grain farmers aren’t the focus of debate over pesticide residue. However, all farmers suffer when consumers are swayed by reports like the “Dirty Dozen List” as it paints an inaccurate picture of conventional agriculture as a whole. Fortunately, farmers from all sectors have a positive story to tell: Ontario farmers have reduced their use of crop protection products by over 50 percent in the last two decades. And the efforts are paying off. Despite fear-mongering reports like the “Dirty Dozen List”, consumers across the country are generally confident in Canada’s homegrown food supply and think farmers are doing a pretty good job at growing our food responsibly. In fact, a Canadian national study on consumer attitudes toward farming and food production conducted by Ipsos Reid last year showed that nine in 10 Canadians feel their food is safe.